The more clearly we can focus our attention on the wonders and realities of the universe about us the less taste we shall have for the destruction of our race. Wonder and humility are wholesome emotions, and they do not exist side by side with a lust for destruction. 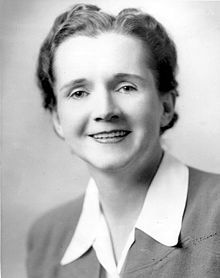 Rachel Louise Carson (27 May 1907 – 14 April 1964) was an American biologist and writer. The aim of science is to discover and illuminate truth. And that, I take it, is the aim of literature, whether biography or history or fiction. It seems to me, then, that there can be no separate literature of science. The winds, the sea, and the moving tides are what they are. If there is wonder and beauty and majesty in them, science will discover these qualities. If they are not there, science cannot create them. If there is poetry in my book about the sea, it is not because I deliberately put it there, but because no one could write truthfully about the sea and leave out the poetry. We have looked first at man with his vanities and greed and his problems of a day or a year; and then only, and from this biased point of view, we have looked outward at the earth he has inhabited so briefly and at the universe in which our earth is so minute a part. Yet these are the great realities, and against them we see our human problems in a different perspective. Perhaps if we reversed the telescope and looked at man down these long vistas, we should find less time and inclination to plan for our own destruction. Mankind has gone very far into an artificial world of his own creation. He has sought to insulate himself, in his cities of steel and concrete, from the realities of earth and water and the growing seed. Intoxicated with a sense of his own power, he seems to be going farther and farther into more experiments for the destruction of himself and his world. There is certainly no single remedy for this condition and I am offering no panacea. But it seems reasonable to believe — and I do believe — that the more clearly we can focus our attention on the wonders and realities of the universe about us the less taste we shall have for the destruction of our race. Wonder and humility are wholesome emotions, and they do not exist side by side with a lust for destruction. We have been troubled about the world, and had almost lost faith in man; it helps to think about the long history of the earth, and of how life came to be. And when we think in terms of millions of years, we are not so impatient that our own problems be solved tomorrow. The real wealth of the Nation lies in the resources of the earth — soil, water, forests, minerals, and wildlife. To utilize them for present needs while insuring their preservation for future generations requires a delicately balanced and continuing program, based on the most extensive research. Their administration is not properly, and cannot be, a matter of politics. Only within the 20th Century has biological thought been focused on ecology, or the relation of the living creature to its environment. Awareness of ecological relationships is — or should be — the basis of modern conservation programs, for it is useless to attempt to preserve a living species unless the kind of land or water it requires is also preserved. So delicately interwoven are the relationships that when we disturb one thread of the community fabric we alter it all — perhaps almost imperceptibly, perhaps so drastically that destruction follows. If we have been slow to develop the general concepts of ecology and conservation, we have been even more tardy in recognizing the facts of the ecology and conservation of man himself. We may hope that this will be the next major phase in the development of biology. Here and there awareness is growing that man, far from being the overlord of all creation, is himself part of nature, subject to the same cosmic forces that control all other life. Man's future welfare and probably even his survival depend upon his learning to live in harmony, rather than in combat, with these forces. Any concept of biology is not only sterile and profitless, it is distorted and untrue, if it puts its primary focus on unnatural conditions rather than on those vast forces not of man's making that shape and channel the nature and direction of life. I shall have to express a very deep conviction: that until we have courage to recognize cruelty for what it is—whether its victim is human or animal—we cannot expect things to be much better in the world. There can be no double standard. We cannot have peace among men whose hearts find delight in killing any living creature. By every act that glorifies or even tolerates such moronic delight in killing, we set back the progress of humanity. Letter to Fon Boardman; quoted in Rachel Carson: Legacy and Challenge, ed. Lisa H. Sideris and Kathleen Dean Moore (Albany: State University of New York Press, 2008), p. 102. Fishes and plankton, whales and squids, birds and sea turtles, all are linked by unbreakable ties to certain kinds of water—to warm water or cold water, to clear or turbid water, to water rich in phosphates or in silicates. The sharpest peaks of the Ridge are the cluster of islets known as the Rocks of St. Paul, near the equator. The entire cluster of half a dozen islets is not more than a quarter of a mile across, and their rocky slopes drop off at so sheer an angle that water more than half a mile deep lies only a few feet off shore. The sediments are a sort of epic poem of the earth. The most alarming of all man's assaults upon the environment is the contamination of air, earth, rivers, and sea with dangerous and even lethal materials. This is an era of specialists, each of whom sees his own problem and is unaware of or intolerant of the larger frame into which it fits. Over increasingly large areas of the United States, spring now comes unheralded by the return of the birds, and the early mornings are strangely silent where once they were filled with the beauty of bird song. These sprays, dusts, and aerosols are now applied almost universally to farms, gardens, forests, and homes — nonselective chemicals that have the power to kill every insect, the "good" and the "bad," to still the song of birds and the leaping of fish in the streams, to coat the leaves with a deadly film, and to linger on in soil — all this though the intended target may be only a few weeds or insects. Can anyone believe it is possible to lay down such a barrage of poisons on the surface of the earth without making it unfit for all life? They should not be called "insecticides," but "biocides." For each of us, as for the robin in Michigan or the Salmon in the Miramichi, this is a problem of ecology, of interrelationships, of interdependence. We poison the caddis flies in a stream and the salmon runs dwindle and die. We poison the gnats in a lake and the poison travels from link to link of the food chain and soon the birds of the lake margins become its victims. We spray our elms and the following springs are silent of robin song, not because we sprayed the robins directly but because the poison traveled, step by step, through the now familiar elm leaf-earthworm-robin cycle. These are matters of record, observable, part of the visible world around us. They reflect the web of life — or death — that scientists know as ecology. We stand now where two roads diverge. But unlike the roads in Robert Frost's familiar poem, they are not equally fair. The road we have long been traveling is deceptively easy, a smooth superhighway on which we progress with great speed, but at its end lies disaster. The other fork of the road — the one less traveled by — offers our last, our only chance to reach a destination that assures the preservation of the earth. "To the bird watcher, the suburbanite who derives joy from birds in his garden, the hunter, the fisherman or the explorer of wild regions, anything that destroys the wildlife of an area for even a single year has deprived him of pleasure to which he has a legitimate right. This is a valid point of view." If a child is to keep alive his inborn sense of wonder without any such gift from the fairies, he needs the companionship of at least one adult who can share it, rediscovering with him the joy, excitement and mystery of the world we live in. A child's world is fresh and new and beautiful, full of wonder and excitement. It is our misfortune that for most of us that clear-eyed vision, that true instinct for what is beautiful and awe-inspiring, is dimmed and even lost before we reach adulthood. If I had influence with the good fairy who is supposed to preside over the christening of all children I should ask that her gift to each child in the world be a sense of wonder so indestructible that it would last throughout life, as an unfailing antidote against the boredom and disenchantments of later years, the sterile preoccupation with things that are artificial, the alienation from the sources of our strength. I sincerely believe that for the child, and for the parent seeking to guide him, it is not half so important to know as to feel. If facts are the seeds that later produce knowledge and wisdom, then the emotions and the impressions of the senses are the fertile soil in which the seeds must grow. The years of early childhood are the time to prepare the soil. Once the emotions have been aroused — a sense of the beautiful, the excitement of the new and the unknown, a feeling of sympathy, pity, admiration or love — then we wish for knowledge about the subject of our emotional response. Once found, it has lasting meaning. It is more important to pave the way for the child to want to know than to put him on a diet of facts he is not ready to assimilate. A rainy day is the perfect time for a walk in the woods. I always thought so myself; the Maine woods never seem so fresh and alive as in wet weather. Then all the needles on the evergreens wear a sheath of silver; ferns seem to have grown to almost tropical lushness and every leaf has its edging of crystal drops. Strangely colored fungi — mustard-yellow and apricot and scarlet — are pushing out of the leaf mold and all the lichens and the mosses have come alive with green and silver freshness. Those who dwell, as scientists or laymen, among the beauties and mysteries of the earth are never alone or weary of life. Whatever the vexations or concerns of their personal lives, their thoughts can find paths that lead to inner contentment and to renewed excitement in living. Those who contemplate the beauty of the earth find reserves of strength that will endure as long as life lasts. She was born in 1907 in the boom of the Industrial Age about 18 miles up the Allegheny River from Pittsburgh, in the town of Springdale. From her bedroom window, she could see smoke billow from the stacks of the American Glue Factory, which slaughtered horses. The factory, the junkyard of its time, was located less than a mile away, down the gently sloping riverbank from the Carsons' four-room log cabin. Passers-by could watch old horses file up a covered wooden ramp to their death. Eliza Griswold, in (21 September 2012)"How ‘Silent Spring’ ignited the environmental movement". The New York Times.